Hej from Denmark. I'll be missing the big Apple event today, but fret not as Team Axios will be there to bring you all the latest, and our initial thoughts and expectations are below. Check the Axios tech stream for coverage during and after the event, and analysis in tomorrow's Login. After months of rumor and speculation, Apple is finally unveiling its plans to take on Hollywood and the news business. Why it matters: Apple's efforts to get into content have had mixed success to date, Axios' Sara Fischer writes. But with iPhone sales drooping, the company aims to make more money from software services, which include news and entertainment as well as storage and payments. What to expect: For months, rumors have swirled that Apple was set on building a direct Netflix competitor — a digital streaming service filled with hundreds of titles to get users hooked. But Recode’s Peter Kafka reported Thursday that Apple plans a different approach. Video: Apple plans to sell subscriptions to cable networks, such as Starz, HBO and Showtime, similar to what Amazon currently offers via Amazon Prime, and taking a cut for itself. The price will be $9.99/month for each service, according to a report Sunday from the Wall Street Journal. Original content: According to several reports, original programming will not be the crux of Apple's TV app. Rather, the point of Apple spending roughly $1 billion on original content is to lure people to buy into its bundle of services or to sell that content individually. So far, Apple has struck deals with big-name producers like Steven Spielberg, Oprah Winfrey, and J.J. Abrams. The company is expected to show clips from some of that programming today. News: Apple also plans to debut its controversial news subscription business at the event for $9.99, per WSJ. While the app may be new, it didn't start from scratch. Earlier reports suggested that some big-name subscription publishers, like the New York Times and Washington Post, are balking at Apple’s terms, which reportedly take half the revenue from each subscription sold. Yes, but: NYT’s Mike Isaac reported Wednesday that the WSJ will participate in the service. Axios is hearing that Apple has not adjusted those terms. Last year Apple bought Texture, a "Netflix of magazines" that gave it access to hundreds of magazine titles. The bottom line: The deal makes sense for non-subscription publishers or those struggling to sell subscriptions, but is less attractive for those who rely heavily on subscription revenue. Gaming: Apple is also planning a subscription service for games, Cheddar reported last month, although it's unclear if Apple will unveil this today. The service would act like a Netflix for gaming, giving users access to many different games under one subscription payment. Our thought bubble: Notable about today's event will be that Apple, which has always made its money from hardware, has a showcase devoted exclusively to services. 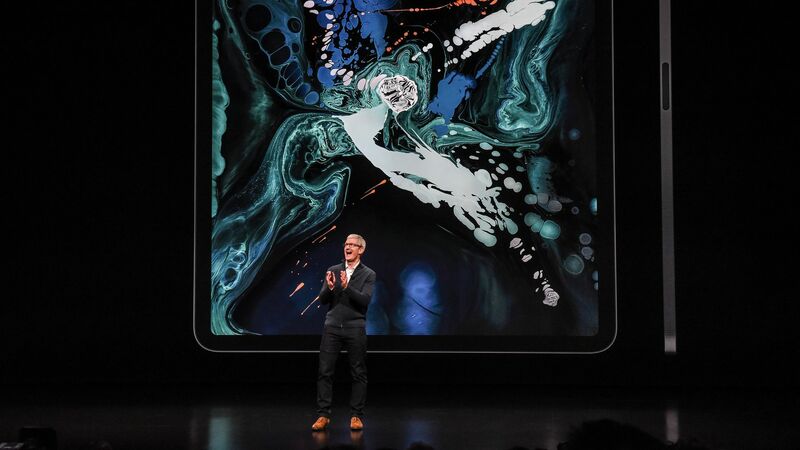 This time, Apple unveiled hardware updates ahead of time (new iMacs, iPads and AirPods), keeping the focus where the company wants it. What’s next: The event will be livestreamed from Steve Jobs Theater at Apple headquarters in Cupertino 10 am PT. Axios’ Kia Kokalitcheva and Sara will be covering. Tuesday, the 2nd Circuit Court of Appeals in New York will hear a case against President Trump for blocking critics on Twitter, Sara reports. The White House has argued that the @realdonaldtrump Twitter account, which was created before the president ran for office, is not his official @POTUS45 government account, and thus the president has the right to block whoever he wants. The plaintiffs — i.e., those who've been blocked — argue that the White House has used the @realdonaldtrump Twitter handle for official communications and thus he shouldn't be able to block people from the account based on the views they express. The bottom line: Trump's prolific use of social media is testing the legal limits of the First Amendment. Deciding what gadgets to bring when traveling is always tricky, all the more so when there is a little one in tow. One common debate is whether to bring some sort of streaming media box or stick. Bring it, and invariably wherever you stay won't have an HDMI connection. Don't bring it, and inevitably the place has a TV with only a handful of channels. What's worse, we always seem to forget some key ingredient, like the remote. Such was the case on our trip to Denmark, when I brought an Apple TV box but no remote. No problem, I'll just download the Apple TV remote app. That does work, but only if you already have the Apple TV box connected to a network. The savior this trip turned out to be the fact that the rental apartment where we are staying has a Samsung Smart TV and I have a loaner Galaxy S10+ with me. A feature called "Smart View" lets you wirelessly mirror anything from a Samsung Phone to the TV. Hello streaming video! With some limitations — outside the U.S., I already knew I'd be out of luck for March Madness (women's and men's) as well as a lot of other video subscriptions I pay for. The pleasant surprise was that both Netflix and Amazon Prime offered a range of content. For Amazon Prime, the content was limited to a selection of Amazon Prime Originals, but that still meant a fair number of kids shows. With Netflix, you have the catalog available in Denmark, which included more than just Netflix-created shows but not all the types of programming I'd enjoy at home. And, with a few quirks. So, yes there was the Ninjago show that my son Harvey requested, but the Ninjas were all speaking Danish. The bottom line: Make sure you pack all your accessories. Netflix and Amazon won't give you everything you are used to, but there will be enough to placate a cranky kindergartner — and give the adults some stuff to binge-watch, too. In Beijing's Zhongguancun district, home to many Chinese tech startups, companies typically have what's known as a "996" schedule, according to a portrait of work life there by the South China Morning Post. "996" means 9am to 9pm, 6 days a week. "In China’s tech industry, young employees and entrepreneurs constantly battle burnout at work, while worrying about bigger things like career ceilings, lay-offs and a sexist work environment." But many of the details, like that work schedule, cast a harsher light, and a recent economic slowdown in China means many companies are cutting back. Chinese tech firms typically hold on to workers for only 2.6 years, a year shorter than the U.S. average. Apple's big services event is in Cupertino (see above). Adobe Summit, focused on business customers, takes place starting Tuesday in Las Vegas. Screens are cheaper than people, which means that "human contact is now a luxury good," NYT's Nellie Bowles writes. Check out this library-themed cake.